This technical, market-oriented, and commercial study of the methanol market used extensive secondary sources, directories, and databases, such as Hoovers, Bloomberg BusinessWeek, and Factiva to identify and collect information. The primary sources are experts from core and related industries, and preferred suppliers, manufacturers, distributors, service providers, and organizations related to all segments of the industry’s supply chain. The bottom-up approach has been used to estimate market size of methanol, feedstock, derivatives, sub-derivatives, end-use industry, and region, in terms of value and volume. The top-down approach has been implemented to validate the market size, in terms of value and volume. With the data triangulation procedure and validation of data through primaries, the exact values of the overall parent market size and individual market sizes have been determined and confirmed in this study. The feedstock suppliers in the methanol market are oil & gas producing companies and coal mining companies. British Petroleum (U.K.), Shell (Netherlands), CNOOC (China), PEMEX (Mexico), China Shenhua Energy (China), Amuminium Corporation of China Limited (China), China Coal Energy (China), and others provide feedstock, namely, natural gas, and coal to the methanol manufacturers. Methanol manufacturing companies such as Methanex Corporation (Canada), SABIC (Saudi Arabia), and Mitsui & Co., Ltd. (Japan) process these feedstocks to prepare different types of methanol derivatives and sub-derivatives, which are suitable for various end-use industries incorporating new technologies. This study answers several questions for the stakeholders, primarily, which market segments need to be focused in next two-to-five years for prioritizing the efforts and investments. 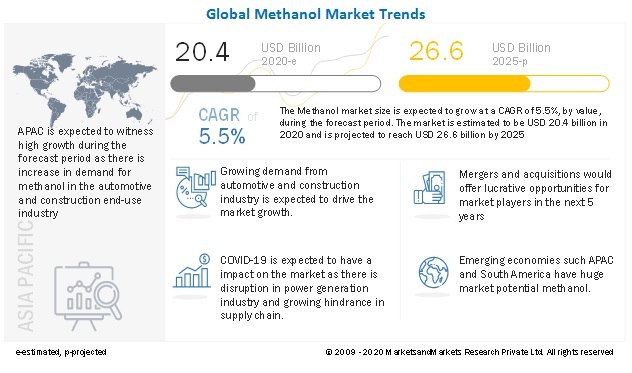 This research report categorizes the methanol market based on feedstock, derivative, sub-derivative, end-use industry, and region and forecasts revenue growth and analysis of trends in each of the submarkets. The global methanol market size, in terms of value, is projected to reach USD 54.16 Billion by 2021, at a CAGR of 12.4% between 2016 and 2021. The increasing use of methanol as fuel in the automotive industry, increasing olefins production from methanol-to-olefin/methanol-to-propylene (MTO/MTP) plants in China, increasing petrochemicals demand, globally, continuous expansions, and various joint ventures & agreements undertaken by different companies are the key factors for the growth of the global market. The MTO/MTP derivative is projected to be the fastest-growing derivative of methanol between 2016 and 2021. Ethylene and propylene are the major feedstocks of polyethylene and polypropylene, respectively. In recent years, the demand for propylene is growing faster than ethylene. But, the conventional technologies used in olefins process are failing to fulfil the demand. MTO technologies are the most economic, and are fulfilling the need for olefins in the methanol market. Automotive is the largest end-use industry of the market and accounted for more than 20% of total market share in 2015. Methanol can be used directly in internal combustion engines of vehicles and aircrafts, with similar efficiency to diesel engines. Currently, methanol is used as an ideal fuel for transportation in many parts of the world, due to its efficient combustion, and low cost compared to all other fuels. 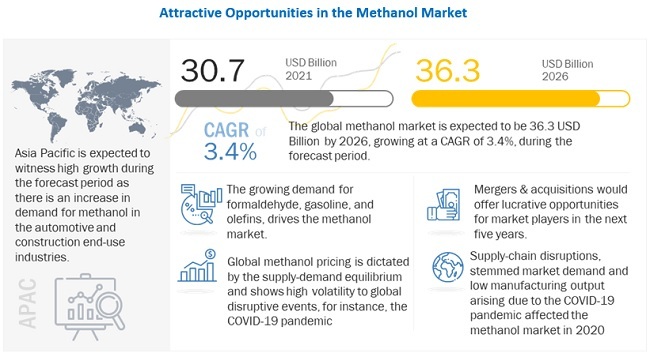 Though the methanol market is gaining importance at a good pace, but few factors act as a bottleneck towards its growth. The use of fuel grade ethanol or bio-ethanol in comparison to methanol restrains the growth of the market. The companies such as Methanex Corporation (Canada), SABIC (Saudi Arabia), PETRONAS (Malaysia), Mitsubishi Gas Chemical Company (Japan), and Mitsui & Co., Ltd. (Japan) are the leading participants in the global methanol market. The diverse product portfolio and strategically positioned R&D centers, continuous adoption of development strategies, and technological advancements are few factors that are responsible for strengthening the position of these companies in the market. They have been adopting various organic and inorganic growth strategies such as joint ventures & agreements and expansions to enhance the current market scenario of methanol. 13.9 Mitsui & Co., Ltd.